Okay, so right now Bob Marley is playing and the sun shining. Whenever the UK is blessed with a mini heatwave, EVERYTHING just feels better... Am I right!? Sunshine = an excuse to wear cute clothes. 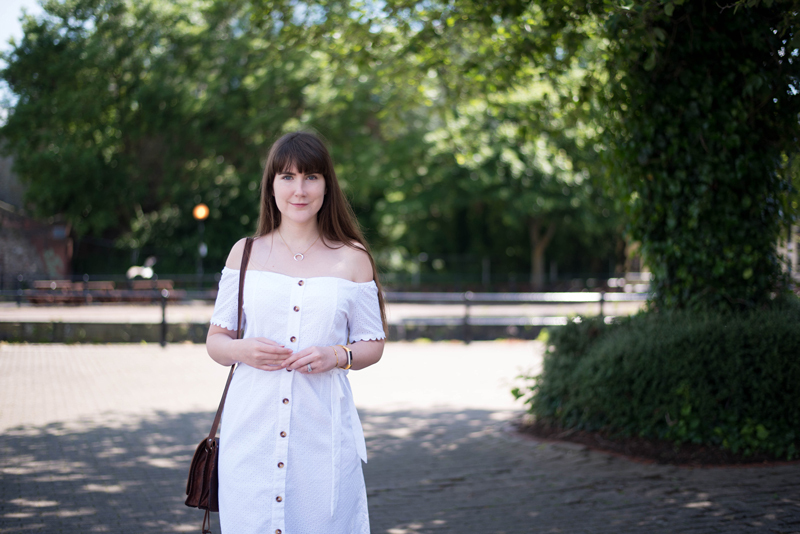 Yes, I do like Autumn / Winter and the layering it brings, but I really enjoy wearing floaty dresses and sandals in Spring / Summer. Oh Next, you're at it again! 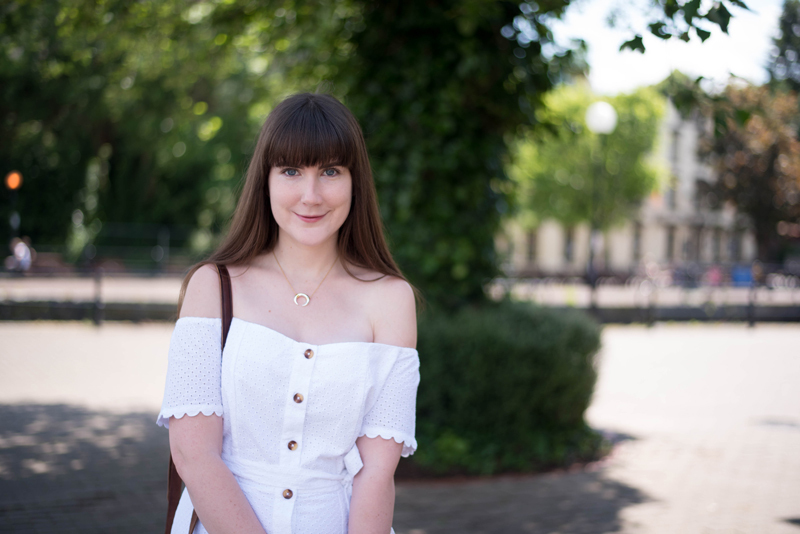 My shopping partner-in-crime (my mum) spotted this White Bardot Dress in-store on Saturday and it was too hard to resist. It's similar to a Next broderie midi dress I missed out on last year, and I wasn't going to make the same mistake twice. This dress is actually part of Next's beachwear collection (say whaaat!?) but I was confident it would work on the streets of Bristol. As much as I love being on a beach, we don't have any sun holidays on the cards. So far we've been to Stockholm and Singapore, and although we have one more trip planned for 2018, it's probably going to be another city adventure. I don't know about you guys, but I get bored after about 15 minutes on a beach. I like to keep pretty active and explore! From a purely practical point of view, this bardot number isn't the best beach dress anyway. It's fully buttoned and as as much as I love buttons, these are heavy duty and take some serious unbuttoning - not something I'd want to fuss around with on a hot beach. I'm really glad bardot is here to stay for SS18 because really do adore this style! It's hella flattering, feminine and gives the impression you made an effort with your outfit, even when you didn't. 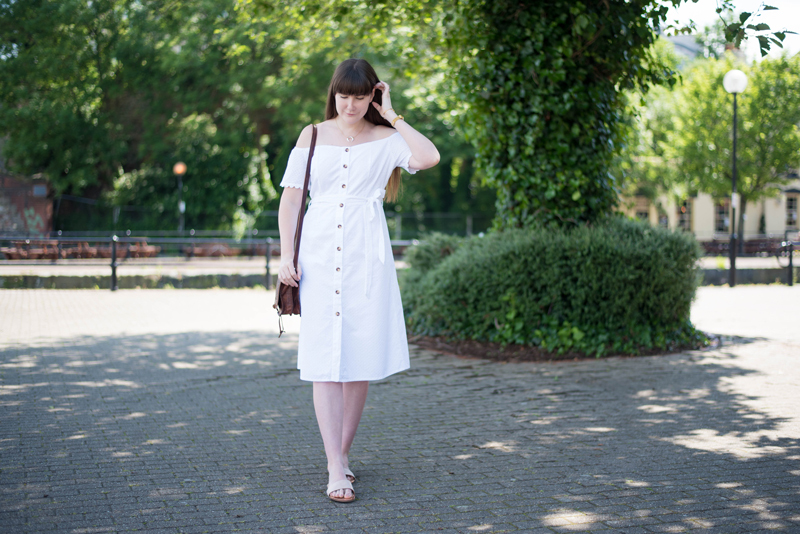 This frock also gains brownie points for being cotton as, it goes without saying, this fabric is breathable and perfect for keeping cool in the heat. I hope to publish a few more style posts over the next month, along with some Singapore content. I had the DREAMIEST trip and I can't wait to share it with you all. I'm also off to see Beyoncé and Jay-Z this week for OTR II! I'm going the first tour date, I'm a huge Jay-Z fan and really loved the Lemonade album, so I'm expecting to be wowed.